If what's happening in Florida's mid-term elections had happened in Africa, the condemnation would have been swift. It's time to reverse this, says Chrispin Mwakideu. It is inconceivable that more than a week after American voters cast their ballots in the mid-term elections, several states still don't know who their representatives are. After all, this is a nation that prides itself on its vibrant democracy and the rule of law, where freedom is the foundation that binds together the 50 states that make up the world's oldest constitutional republic. On November 6, Americans went to the polls to elect representatives in both the House and Senate. That the Democrats would win the House was widely expected. Republicans retained and even strengthened their majority in the Senate. US President Donald Trump was quick to downplay the Republican losses. To his credit, he congratulated Nancy Pelosi, who is likely to be the next speaker of the House, but in his customary way used his Twitter handle to threaten the Democrats who are expected to frustrate his agenda come January. Nothing so surprising there -- but then came the bombshell. On Saturday, Florida announced a full recount of all votes in the Senate race as well as the gubernatorial race. This came after the Democratic candidate in the governor's race, Andrew Gillum, had publicly conceded defeat to his Republican rival Ron Desantis. Results in Georgia, where the first African American woman Stacey Abrams is running for governor, are so tight that a federal judge has stopped the announcement of results before Friday and ordered a review of thousands of provisional ballots. President Trump has been crying foul, alleging voter fraud and calling for the recounts to be stopped. He has provided no evidence for his accusations. Now just pause for a moment and imagine the reactions if the same electoral drama in the US had taken place in an African country. The US would have been the first to issue a scathing rebuke and lecture the Africans on how important it is to conduct elections that are free, fair and credible. Well, this time the US has failed that test. Africa must now step up and categorically criticize the way the US elections have been conducted. This is not about revenge, (remember Trump reportedly referred to African countries as sh**hole countries?) but it's about reminding the US of the proverbial saying: you should first remove the plank from your own eye before removing the speck from your brother's eye. 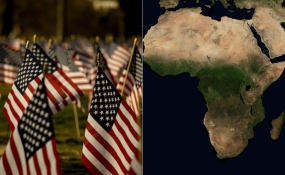 Africa should expose the US for its hypocrisy! The US, with all its military might, pride and branding as the most advanced nation on earth is far from perfect. Its electoral process is flawed and its democracy -- though an inspiration to many countries -- has its weaknesses. Firstly, in an ideal democracy, the candidate who wins the most votes in an election should be declared the winner. Trump lost the popular vote to Hillary Clinton by more than 3 million votes but still won the presidency after clinching enough Electoral College votes. The Electoral College is a constitutional body made up of 538 representatives who decide the next US president and vice president. In other words, a majority of ordinary US voters could vote for one candidate and still end up with another. What's the difference between such an outcome and a dictator in Africa who bends the will of the people in order to stay in power indefinitely? Secondly, compared to electoral systems in Africa, the US has a decentralized electoral structure. Many key decisions such as voter registration and how the voting will be conducted are made at state and local levels. In Florida, the Democratic candidate for the Senate is now calling on his Republican rival to recuse himself from the vote recount. He claims the governor will use his power to undermine the voting process. Don't get me wrong, there is nothing wrong with recounting votes or mounting legal challenges over election results. We saw in Kenya the Supreme Court nullifying the presidential election results and ordering a fresh one. In Ghana, the opposition challenged the results in 2012 but lost. What is strange about the US is that the candidates in power do have considerable say over how the electoral process runs. In Africa, we have independent electoral commissions. And if they truly stay independent, then we can trust the results. One more thing, whenever an election takes place in Africa, like the one coming up in the Democratic Republic of Congo on December 23, the US and other western countries are quick to deploy election observer missions. The observers' thumbs up or down on an election could determine not only how the voters but also how the international community perceive the outcome. Maybe, just maybe, the African Union and its regional bodies could deploy election observers in the US 2020 election.